Researchers have discovered that Atlantic killifish are now 8,000 times more resilient to high levels of toxic waste than other fish, allowing them to survive extreme levels of pollution that would normally be deadly. It sounds like an evolutionary success story, but examples like this are exceptionally rare in the animal kingdom. New research published in the journal Science shows that urban-dwelling killifish who swim in four severely polluted estuaries along the US East Coast have evolved strong resistance to lethal, human-altered environments. Owing to their unique genetic make-up, these fish are now thousands of times more resilient to high levels of pollution than other fish. Evolutionary processes are typically slow, making it difficult for species to adapt to human-induced environmental changes. Researchers from UC Davis have discovered that the killifish features a higher level of genetic variation than any other vertebrate sequenced so far. Like insects, weeds, and bacteria, these fish can adapt quickly to all sorts of environmental stressors. Indeed, animals without this kind of genetic elbow room often can’t adapt quickly enough, or even at all. Some highly-specialized species can’t deviate too far from their genetic script, making most mutations extremely disadvantageous. In the study, the scientists sequenced the genomes of nearly 400 Atlantic killifish from both polluted and non-polluted sites at New Bedford Harbor in Massachusetts, Newark Bay, New Jersey, Connecticut’s Bridgeport area, and Virginia’s Elizabeth River. These waterways have been contaminated since the 1950s and 1960s by dioxins, heavy metals, hydrocarbons, and other nasty industrial pollutants. Genetic analysis shows that these fish are well-suited to radically altered-habitats. Fascinatingly, all of the fish acquired similar adaptations to the toxic waters, even though they swam in different environments. This is a great example of convergent evolution at work, when animals in different habitats stumble upon the same solution independent of one another. 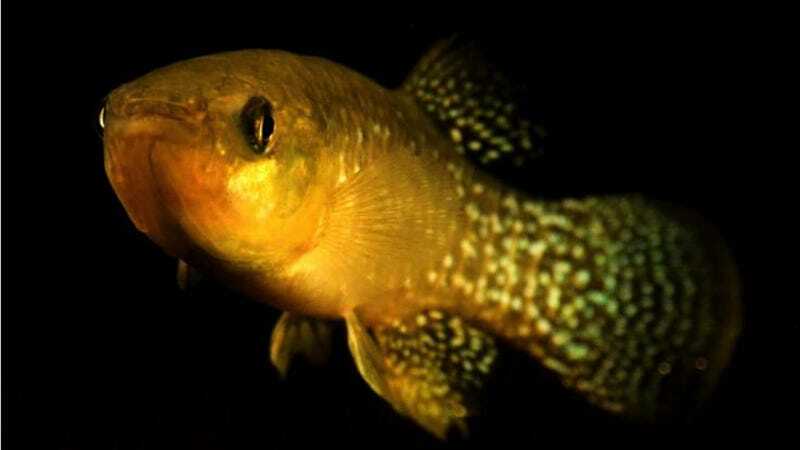 The researchers say it’s possible that the killifish were primed for this evolutionary shift by virtue of a shared genetic quirk that drove the rapid adaptation to pollution. The study might help explain how genetic differences among humans and other species contribute to differences in sensitivity to environmental chemicals. “If we know the kinds of genes that can confer sensitivity in another vertebrate animal like us, perhaps we can understand how different humans, with their own mutations in these important genes, might react to these chemicals,” Whitehead said. Killifish along the US East coast may have evolved a tolerance to toxic waste, but there’s a big downside to all this. These fish are a popular prey animal for a number of species, who must now face the health consequences of feasting on a food source that thrives in polluted waters. We won’t know the downstream effects of this adaptation for years to come.